The Neo Tourbillon with Three Bridges Skeleton is a natural extension of several Girard-Perregaux fundamentals. The first is the 1884 patent for a tourbillon with three bridges visible on the dial side, the principle underlying the “With Three Gold Bridges” architecture and unique signature of Girard-Perregaux fine watchmaking. 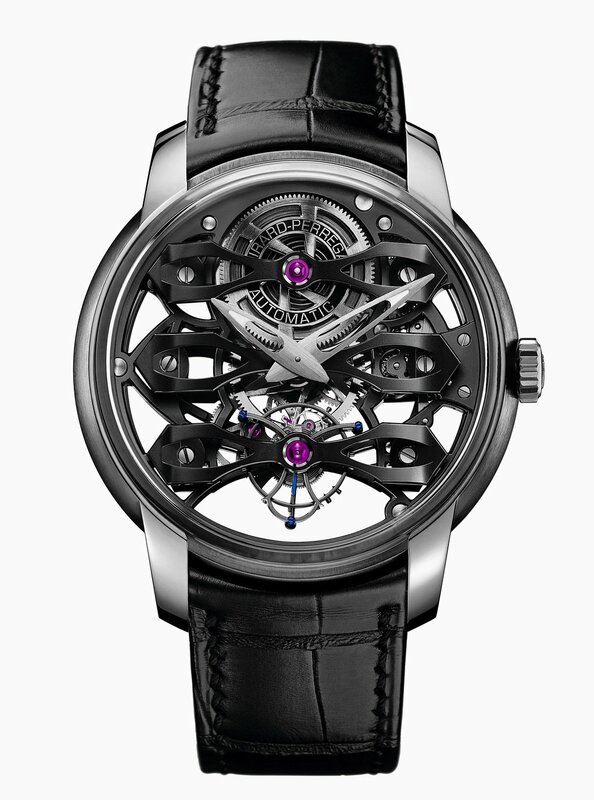 The second is the skeleton working on this type of movement, that Girard-Perregaux has been practicing since 1998. The third stage was the birth in 2014 of the Neo Tourbillon with Three Bridges. The latter were not straight, flat or in gold, but instead arched, taut, rounded, openworked and black. These technical and aesthetic characteristics have made it an exemplary embodiment of modern Haute Horlogerie. Combining these three pillars of the Girard-Perregaux identity has given rise to the Neo Tourbillon with Three Bridges Skeleton. The architecturally-based construction is an omnipresent factor in the work of Girard-Perregaux. The Neo Tourbillon with Three Bridges Skeleton conveys references to the innermost elements of artistic construction. Dominated by sapphire rather than titanium, the case is built so as to maximise the view of the movement, itself based on the principle of transparency. The dial-side crystal is of the glass box type, steeply cambered and convex. It rises vertically from the case, before changing angle to cover the heart of the watch, like a protective dome. The caseback crystal is also convex, meaning that, when viewed from the side, the Neo Tourbillon with Three Bridges Skeleton is a band of grey metal with a matt appearance achieved by satin brushing, framed by two sapphire protrusions. In architecture, these are what are referred to as the “skin” of a construction. This technical and visual layer ensures transparency and reveals the structure, revealing the internal network of reinforcements that give strength and shape to a building. In this instance, the sapphire skin plays a starring role in the watchmaking show, as well as in its structural requirements and in expressing the distinctive Girard-Perregaux style. The supple, light and truly spectacular Neo Tourbillon with Three Bridges Skeleton is a modern expression of Girard-Perregaux’ structural and technical mastery. Its architectural inspiration is a nod to cable-stayed bridges, which are airy and spectacular manifestations of human genius. The Neo Tourbillon with Three Bridges Skeleton is a spick and span feat of engineering in terms of its horological significance. This is bridge-building between two worlds: Fine Watchmaking, of which Girard-Perregaux is one of the worthiest exponents; and contemporary design.